1901: Henry Ford built and raced (10 Oct.) his Sweepstakes car v. Alexander Winton. 1903: Ford begins. Model A Ford produced. 1908: Model T Ford introduced, initially built at the Piquette Road Manufacturing Plant. A 2-door roadster cost $825. Assembly line production was developed over the next 5 years. 1911: Ford assembly in the UK, at Trafford Park, Manchester. 1913: Ford introduced the moving assembly line. 1922: Ford bought the Lincoln Motor Company from Henry Leland on 4 February. 1925, .au: Ford Motor Company of Australia formed and started assembling Model Ts (see 2016 below). 1927: "The formal end of Model T production." 1929: Production started at a new UK factory, Dagenham. 1934, .au: "The world's first coupe utility, model 40, designed and built by Ford Australia." -- abc. 1945: Fordson Major tractor begins production at Dagenham. 1948: Introduction of the F-Series (F-1 to F-8) "bonus built" trucks. 1953: First F-100 pickup truck (replaces the F-1). 1954: Ford Thunderbird production began in September. 1960, June 28: The first, XK, Falcon was produced at Broadmeadows, .au -- 2359cc ohv straight-6, 67kW, 187Nm, 3-speed manual or 2-speed auto..
1962, October: The Ford Cortina was launched, 2-door, from £639. The Cortina Mk 2 followed in 1966. 1964: The Ford Mustang began production in March, priced at us$2,368. It made an appearance in the movie Goldfinger but not as Bond's drive which was a DB5. 1965: The Ford Transit Van was launched in the UK and Europe; eventually the typical Transit driver became colloquially known as "white van man." 1965: Jim Clark won the Indianapolis 500 in a Lotus-Ford. 1966-1969: Ford GT40s won the Le Mans 24-hour race 4 years in a row. 1972, .au: "The Australian designed Falcon XA was introduced" -- abc. 1975: First Ford F-150 pickup truck (ute). 1986: A replacement for the mk-1 Transit van. 1987: Ford bought 75% of Aston Martin, and 100% in 1994. 1999: Ford bought Volvo's car-making division (but not the trucks). 2000: The mk-3 Transit van range offered front-wheel drive in the smaller models. 2000: Ford bought LandRover from BMW. LR joined Aston Martin, Jaguar, Lincoln and Volvo in Ford's Prestige Automotive Group. 2001: Ford F250 and F350 trucks back on sale in .au. 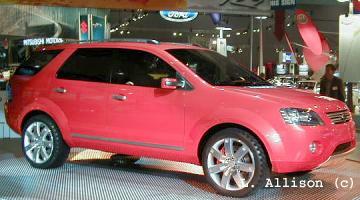 2002, Feb. 28: The Ford R7 4×4 concept or, it was said, prototype of a possible passenger car of the near future at the Melbourne International Motor Show. The R7 featured independent suspension front and rear. The car looks very large but is shorter than the current Ford Falcon. 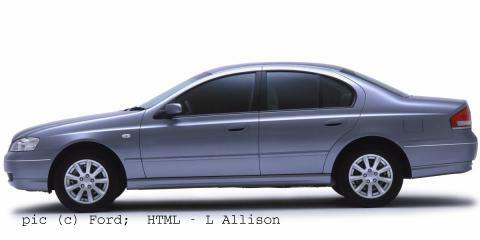 2002 July: The updated 'BA' (Barra) Ford Falcon (4×2) soon to replace the unloved 'AU'. 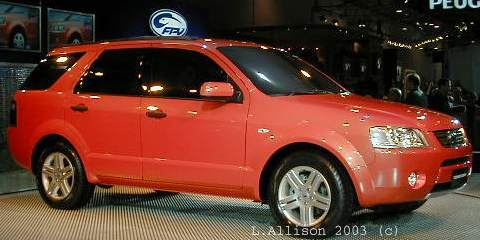 2003 February: Ford had one of its 15 prototype Territory (was R7) all wheel drives at the Melbourne Motor Show. 2004: On sale as 6-cyl. 4×4 and 4×2 versions. 2007, March: Needing to raise cash, Ford sold Aston Martin to an investment group for £475m (apart from a £40m holding). David Richards, head of Prodrive, became the new chairman of Aston Martin. 2007: Jaguar and LandRover also put up for sale. 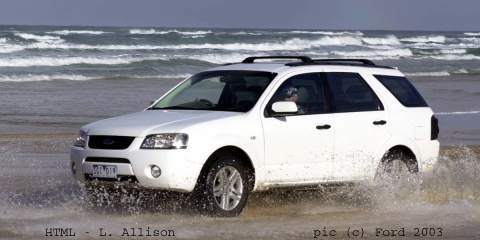 2008, March 26: Ford agreed to sell Land Rover and Jaguar to Tata Motors of India for us$2.3billion. The deal was completed on 2 June 2008. 2010 March 28: Zhejiang Geely Holding Group Co. Ltd (.cn) signed to buy Volvo Cars from Ford for us$1.8billion. The deal was completed by 2 August 2010. 2010: Ford ends production of the Mercury marque, in late 2010, in favour of Lincoln (announced 2 June 2010). 2013, May 23: Ford announced that it would stop building cars in Australia in 2016. 2016 October 7: Ford Australia shut its Broadmeadows and Geelong factories (see 1925 above).